Pretoria is situated about a 40min drive North of Johannesburg, South Africa. The city is home to The Union Buildings, the official seat of the South African government, and one of the main centres of political life in the country, as well as where the President has his offices. Pretoria is also packed with international Consulates, and there is a constant stream of high-level political and consular activity in the city. Of course, accommodation in Pretoria has to be able to cope with the influx of influential visitors, and consequently there are many resorts and hotels in Pretoria to accommodate even the most discerning foreign delegates. There are 11 5-star hotels in Pretoria to welcome politicians and other well-heeled visitors, while the majority of the other hotels in Pretoria fall into the mid-range bracket. There are also a large number of places to rent in Pretoria, to cope with the demand from consular staff and visiting government officials, many of whom prefer self-catering accommodation in Pretoria. 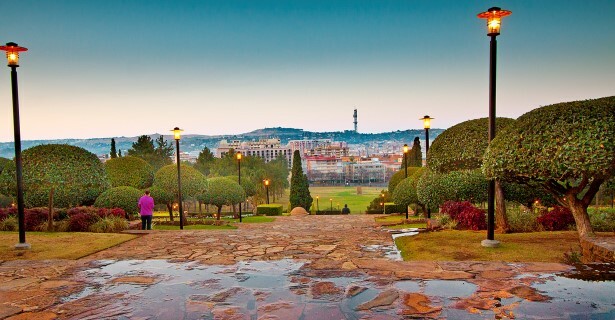 Pretoria is also home to UNISA, the distance-learning University of South Africa’s main campus, and is visited by thousands of students attending courses, as well as visiting lecturers. To satisfy the demand for cheap accommodation there are many apartments to rent in Pretoria and there are also several good bed and breakfast or guesthouses in Pretoria that offer everything from a cheap and cheerful room to 5-star boutique-style accommodation. Some good apartments to rent in Pretoria include Accommodation @ Van’s and Faircity Grosvenor Gardens. Some of the cheap hotels in Pretoria close to UNISA are Protea Hotel Capitol and the Morning Star Express Hotel, while if you are looking for luxury close to the university Illyria House might be the one for you! Pretoria Backpackers provides an option for those on a very strict budget. The Pretoria suburb of Centurian is situated about half-way between Pretoria and Johannesburg and is home to a huge industrial and business park, with a consequent need for accommodation and conference facilities, and there are several excellent good hotels in Pretroria, South Africa in this area to satisfy the need for quality accommodation. One of the best choices for a conference would be the Royal Elephant Hotel and Conference centre, while the Centurion Lake Hotel and the Protea Hotel Waterfront are also good options for both business and pleasure. If you are visiting Pretoria to watch your favourite Rugby team play at Loftus Versfeld Stadium, your best bet for accommodation in Pretoria close to the stadium would be the Faircity Grosvenor Gardens Hotel, the Absolute Farenden Apartments (both 4-star) or the Brooklyn Guesthouse Pretoria and the Murray Street 137 Guest House (both 3-star). Browse our listings to find where to stay in Pretoria and secure the best deal on accommodation in Pretoria.